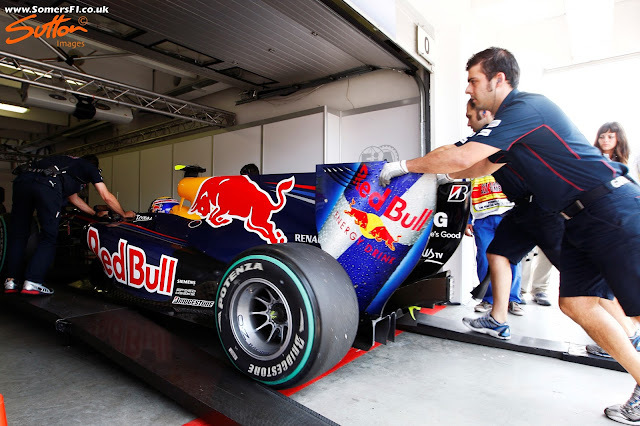 Having missed the first pre-season test in Valencia, Red Bull arrived to the 2nd test in Jerez and launched the RB6 in the pitlane. 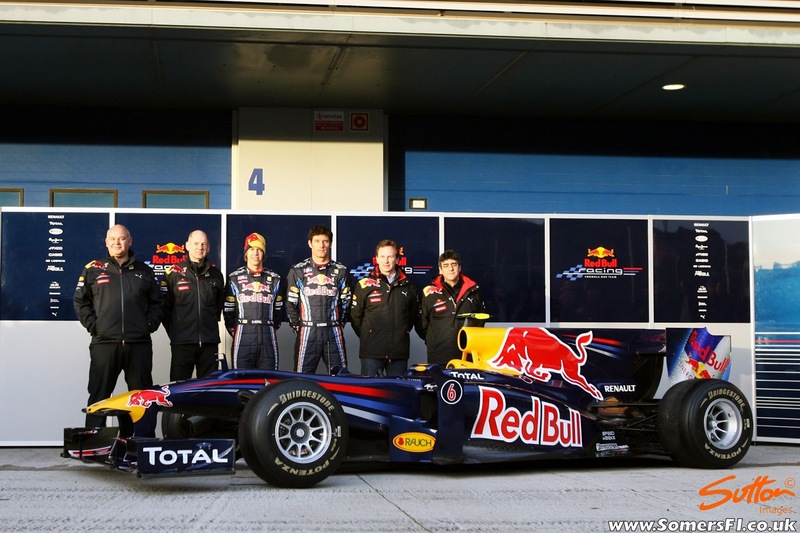 Rob Marshall, Adrian Newey, Sebastian Vettel, Mark Webber, Christian Horner and Peter Prodromou stand alongside their 2010 challenger. 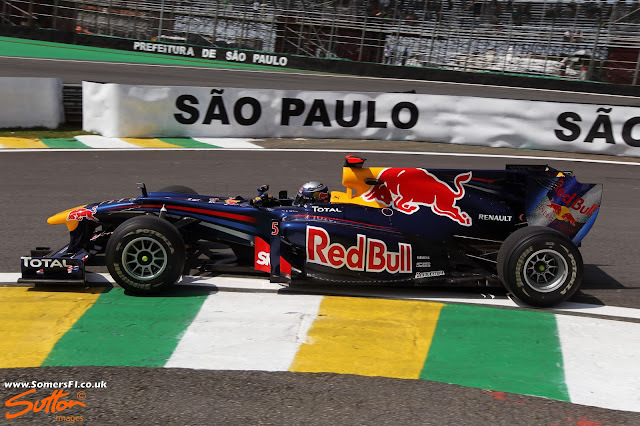 The RB6 was an evolution of the teams 2009 challenger, which finished the season strongly taking the last 3 victories. 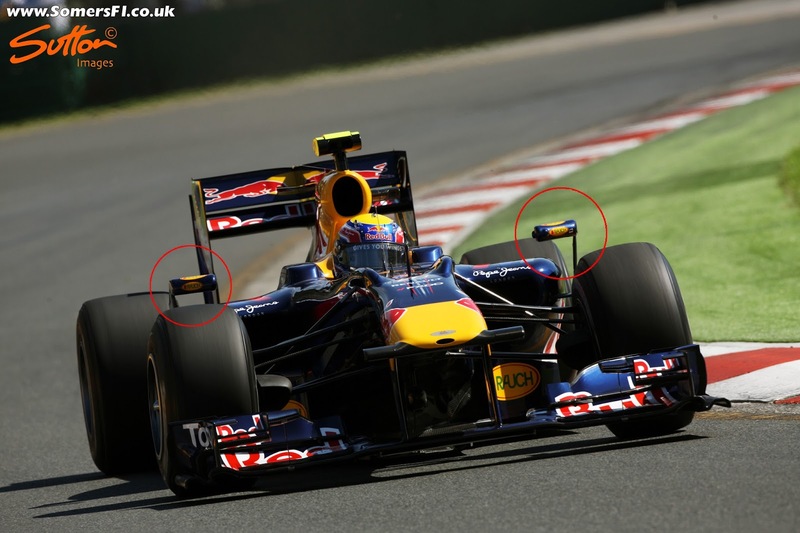 Changes in the regulations for 2010 meant that refueling was banned, which increased the length of the cars and would clearly have an impact on chassis dynamics. The double deck diffusers that caused controversy in 2009 were cleared for use and would be refined around the teams usage in the previous season. At the last day of pre-season testing a new exhaust was fitted to the RB6. The cheeky scamps even fitted a sticker in roughly the same position as the old one to try and fool onlookers. Circled in the images above (left) the old exhaust sat just below the upper rear wishbone, which was also amended. 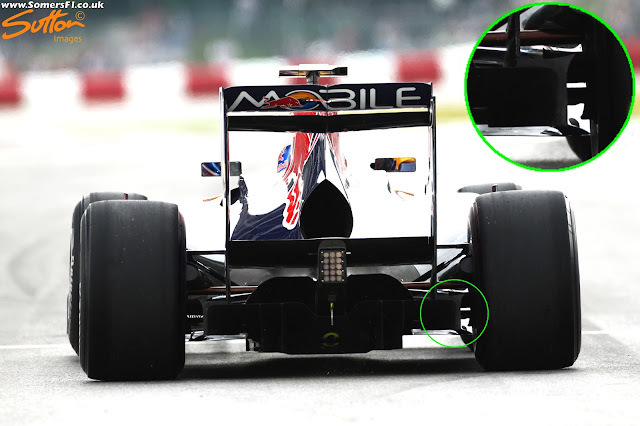 The lower position (right) was the first iteration of this new incarnation of the exhaust blown diffuser. 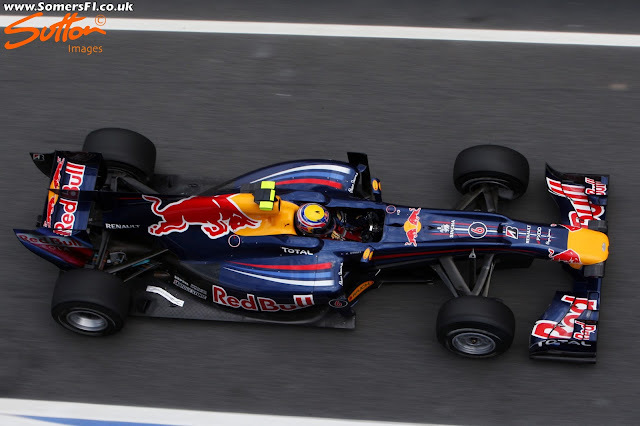 RB6 from above, you can see where Red Bull applied the stickers on the upper surface of the bodywork, whilst below you can just make out the metallic inserts used on the exhaust exits. The changes weren't limited to just the exhaust layout either, as the engine cooling outlet and diffuser shape were changed too. I've highlighted the changes in the images above. 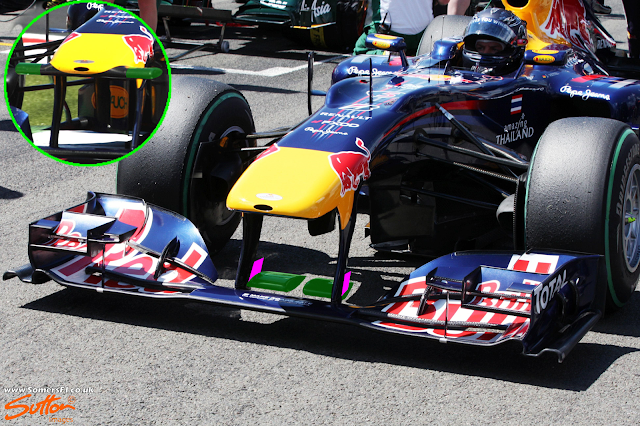 As we can see the cooling outlet (purple) was enlarged to deal with the additional thermal output of the engine. 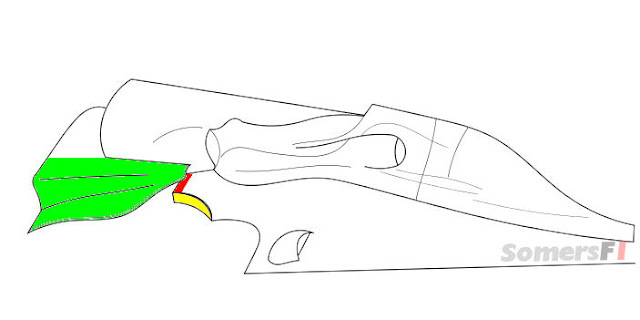 The diffuser was amended, with the boat tail adjusted to allow the area around the crash structure to be opened up, increasing the secondary diffuser deck size. 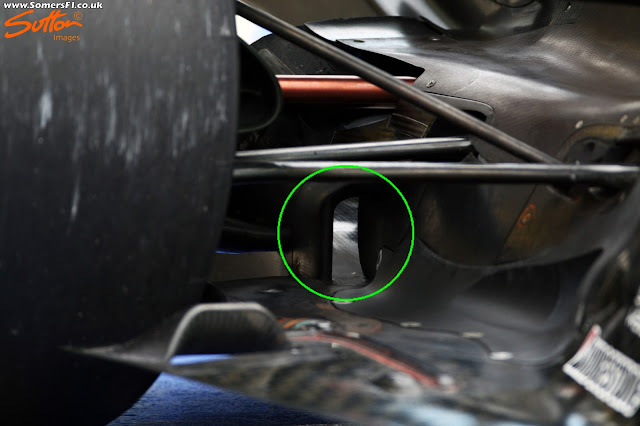 An opening also appeared (below), that would allow flow to move from outside the coke bottle into the secondary deck, something that the placement of the exhaust would have particular bearing on. The exhaust plume (red) is highly energetic so helps to pull surrounding airflow, which is often slower moving, along with it. As you can see the intent was to direct the plume at the opening, which would help to draw the airflow through the upper diffuser deck. Meanwhile some of the plume would envitiably spill the other side of the opening into the outer diffuser channel, energising it too. The other interesting part of the RB6's diffuser layout is the way in which the outer sections of the diffuser were compartmentalised from the central section. The floor actually stopped short of the diffuser toward the start of the secondary decks expansion (marked in red), allowing airflow to filter in from above the floor, into the diffusers outer channels. 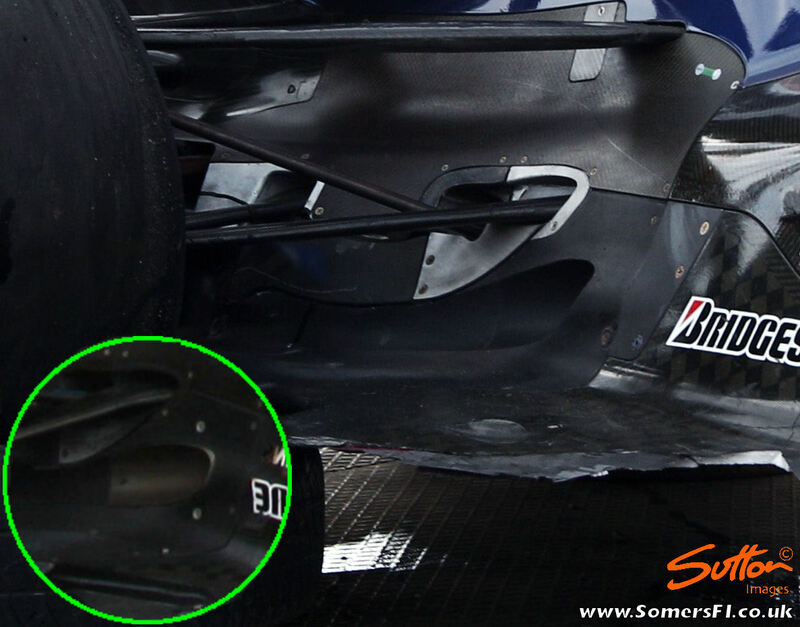 This meant the outer section of the diffuser (marked in green) acted like a footplate and was hung from the side of the secondary deck. Meanwhile, a floor scroll was mounted on the edge of the floor (marking in yellow) to help roll up and vorticise the flow around it. 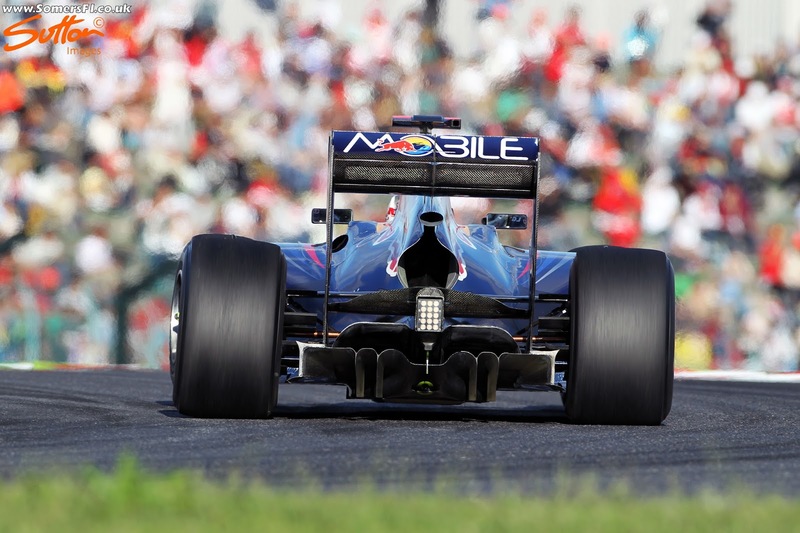 Whilst on its own the exhaust placement provided the team with additional performance it was their work with Renault that allowed them to maximise it. Ordinarily the problem with using the exhaust to energise the diffuser is that the flow is inconsistent, as coming off the throttle would mean the exhaust plume dissipates. 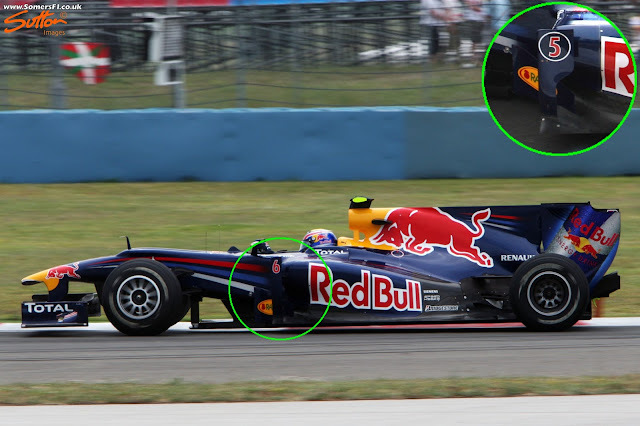 To overcome this Red Bull and Renault devised methods with which to keep the exhaust blowing, even when the driver lifted out of the physical throttle. Inititally they used cold-blowing, using engine map settings they'd ramp the throttle up when the driver came off the physical one, cutting fuel and spark and turning the engine into an air pump. 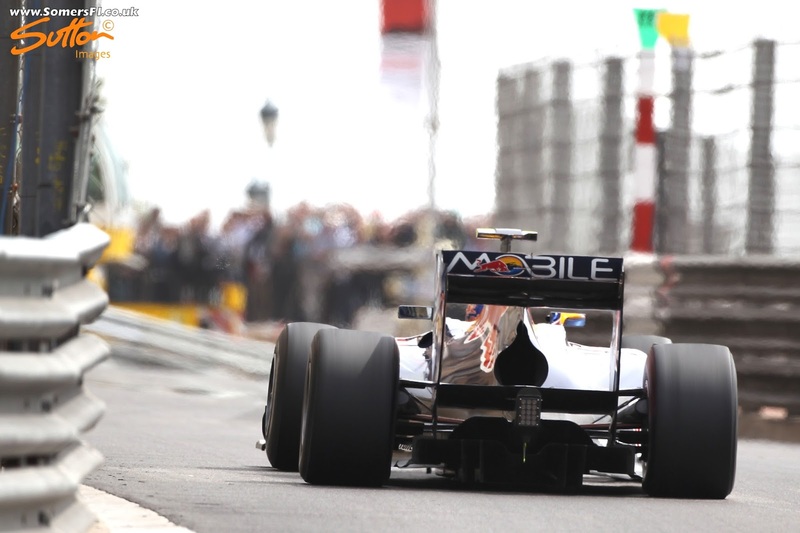 For limited running, usually as a qualifying mode (which was developed further in 2011), they developed hot-blowing, which meant allowing a small amount of fuel to pass through too. Without the spark it wouldn't combust in the cylinders but once it reached the exhaust it would, energising the exhaust plume further. Having taken pole in Bahrain, Vettel led the race comfortably until a problem with the Renault engine curtailed power. It was latterly diagnosed as a failed spark plug, which reduced the engines overall performance, with the German having to take 4th place. Meanwhile, Webber finished down in 8th having recovered from what seemed like an oil leak early in the race. The damaged spark plug may have been the first indication of what Red Bull and Renault were doing in terms of blowing off throttle, a topic I'll cover more extensively later. More trouble followed in Australian when having locked out the front row of the grid, Vettel had issues on lap 25 and retired from the race. Initially blamed on a brake failure but latterly determined to be a problem with the securing lugs. 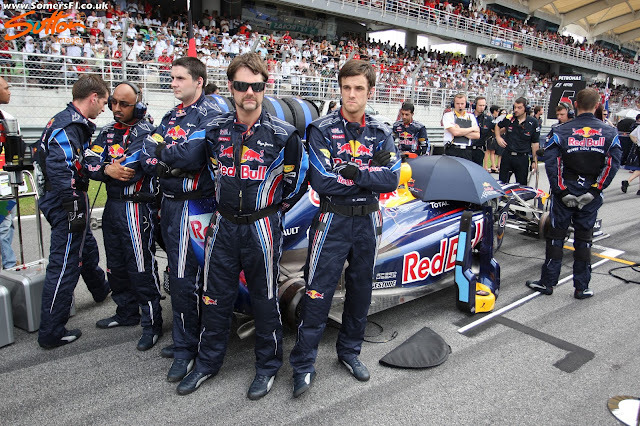 Meanwhile Webber had his own issues which saw him finish down in 9th. The events that unfolded at the Australian GP led to the FIA issuing a change to the regulations, with outboard mirrors, that teams had taken to mounting on the sidepod airflow conditioners, were to be excluded from the Spanish GP, insistant they must be mounted from the monocoque instead. 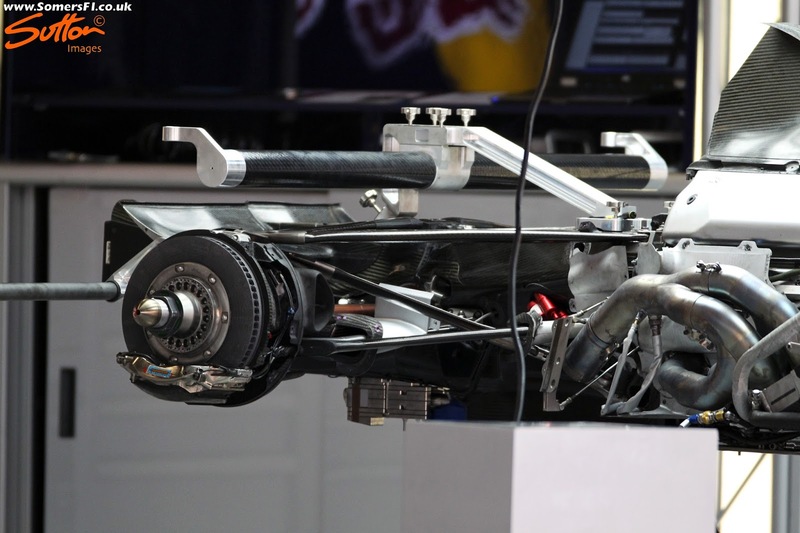 More controversy was brewing too, as rival teams suspected that Red Bull were using a ride height device to achieve a different performance offset between qualifying and the race. 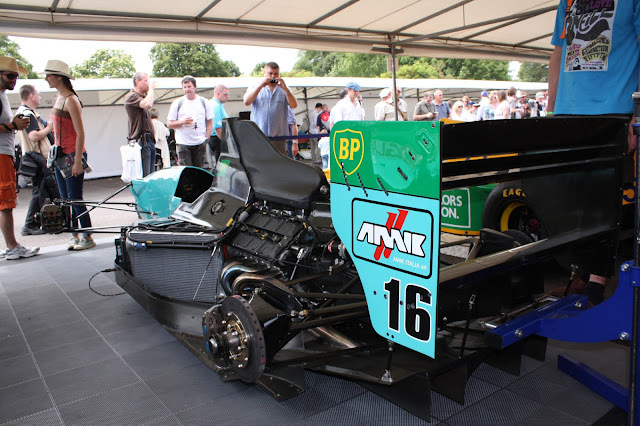 Pictures had surfaced that showed the RB6 with a different attitude (rake) between the two sessions, with many coming to the conclusion that this provided the team with a qualifying boost. 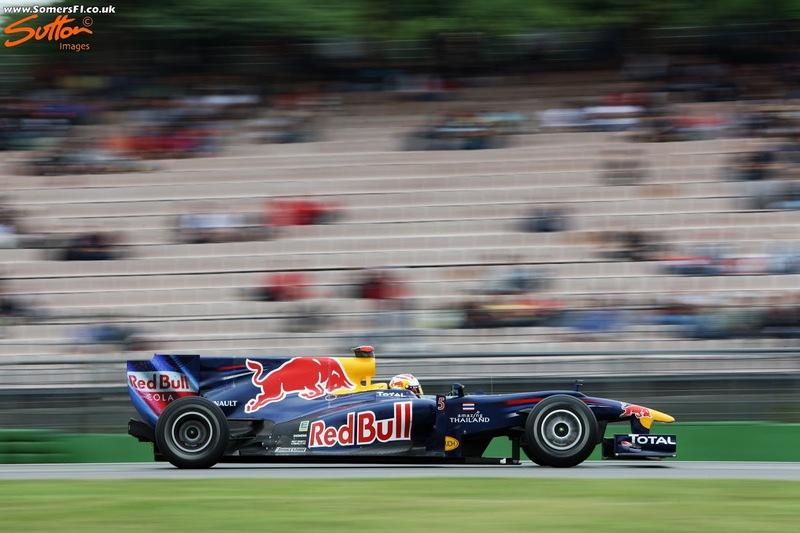 Red Bull opened their account in Malaysia with Sebastian Vettel taking the win, whilst Mark came in just under 5 seconds behind his counterpart to clinch 2nd place. Bouyed by their result in Malaysia the team had more to be pleased about when they locked out the front row in qualifying. 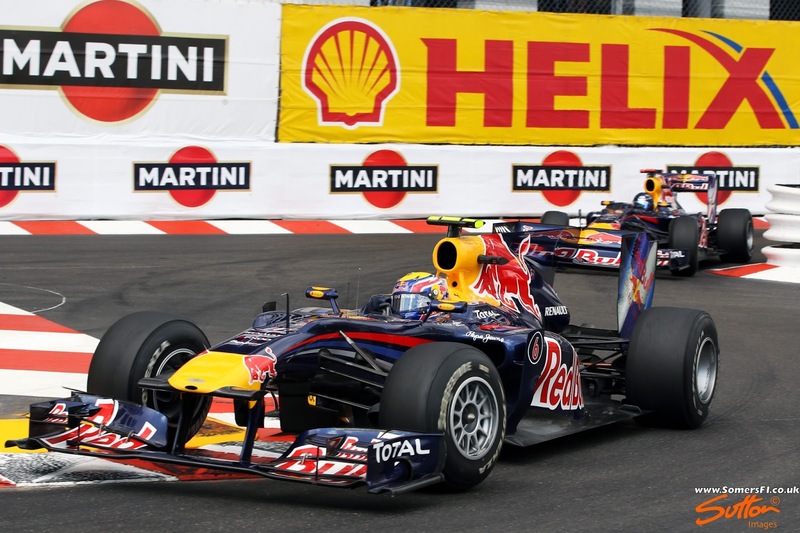 The race didn't quite match their aspirations though, with Vettel finishing in 6th and Webber in 8th. The Chinese GP saw the teams first major design alterations of the season with a new front wing and turning vanes put to use. The wing introduced several changes with perhaps the most visceral coming from a change in the upper flap shape, something that continues to feature on even todays challengers. The change in philosophy to the upper flap is also matched by the change to the mainplane to neutral section juncture. This is important as it changes how the the two surfaces create and shed a vortex that can be used to control other aero structures downstream. The upper flap geometry change was matched by one to the mainplanes upper tier too, with the slot running from the neutral section to the mainplane arc being retained. 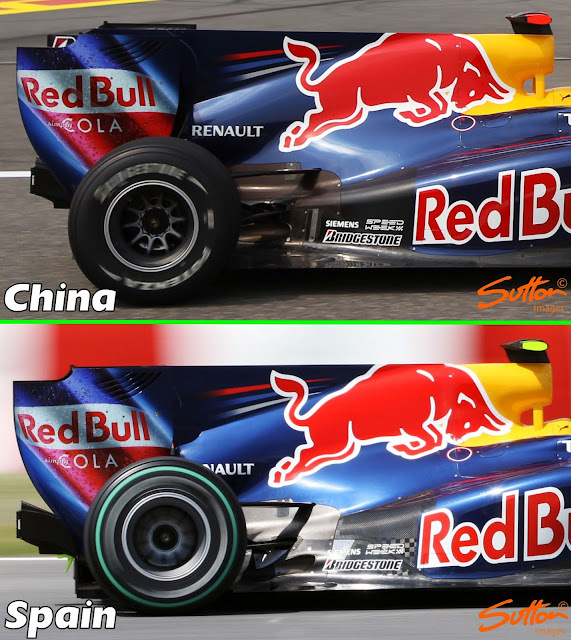 The new L shaped turning vanes which coincided with the front wing update for China are highlighted in green in the image above. 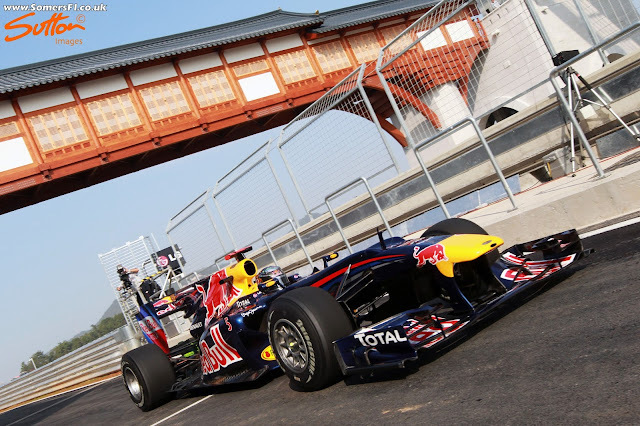 Sutton Images captured this rather delightful image of the RB6 during preparations for the Chinese GP. It gave us the first real glimpse of the torturous exhaust pipework required to place its exit just above the floor, with the team clearly working hard to retain the requisite primary lengths so that power wasn't vastly curtailed. 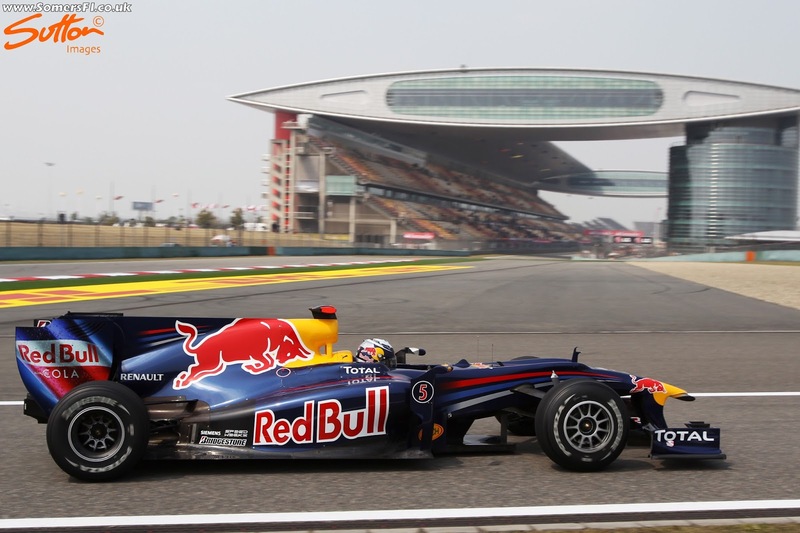 Webber and Vettel took pole and second place respectively in qualifying for which their pace suggested they'd dissapear come raceday. Contrary to that suggestion Webber was kept honest by Hamilton, who'd jumped Vettel in a slow pitstop for the Red Bull team. 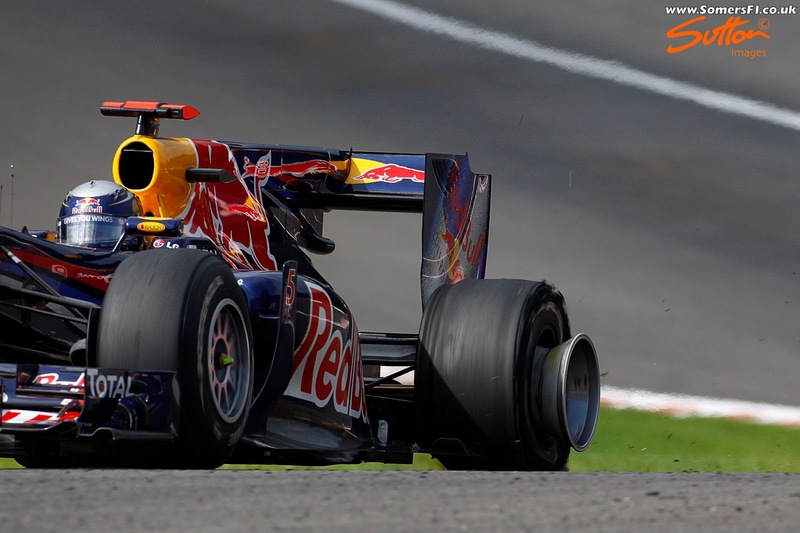 Webber took the victory whilst Sebastian had to settle for third place. A return to Europe usually heralds a significant stage in the cars development, with teams able to ship much larger components more easily. NB. In recent seasons this has abated a little, as teams are able to 3D print some elements on site and we have even seen them make ad-hoc changes to larger components by cutting and shutting them. The RB6's exhaust design was amended significantly in Spain, with the bodywork surrounding it and the sidepods shrunk, changing how the airflow passed around them toward the double deck diffusers window in the coke bottle region. Meanwhile, the team added a tyre squirt hole in the floor ahead of the rear tyre (circled) which helps to shape the wake shed by the rear tyre and ordinarily impinges on diffusers performance. 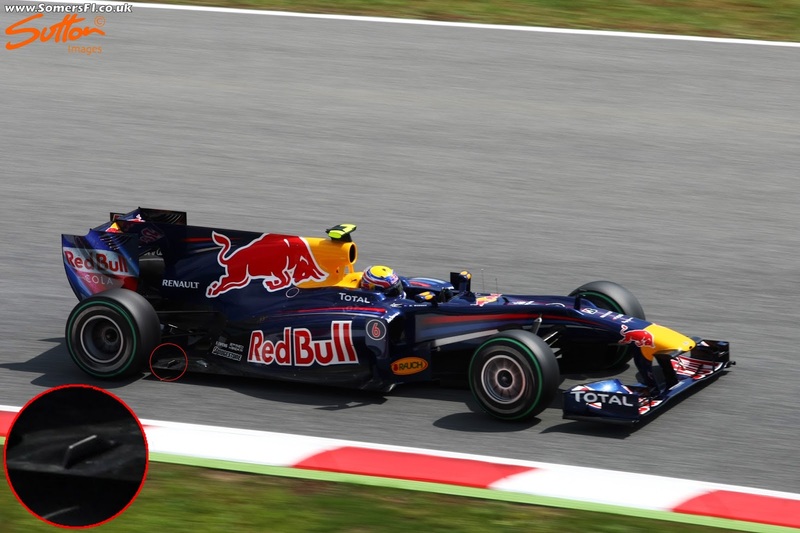 Bouyed by his victory in Spain, Webber was quickest in qualifying once again, with his team mate missing out to second by a tenth to Robert Kubica. He swiftly overcome the Renault driver with the Red Bull drivers taking their second one-two of the season. 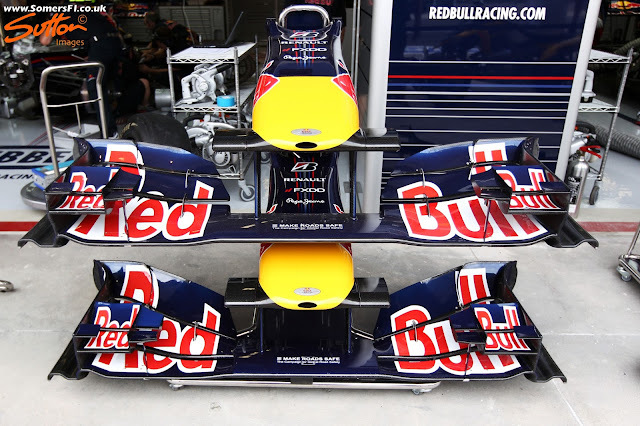 The team had a new rear wing mainplane available in the principality collating airflow, which would ordinarily separate owing to the shark fin. And like the Y75 slot above, displaced it to the rear surface of the wing, as the hollowed out wing created the effect of a third full span wing element, improving efficiency. You'll note that the shape of the beam wing was also modified in order to improve rear downforce, with upswept outer sections and arrow head central section improving the aero connection between the rear wing and diffuser. 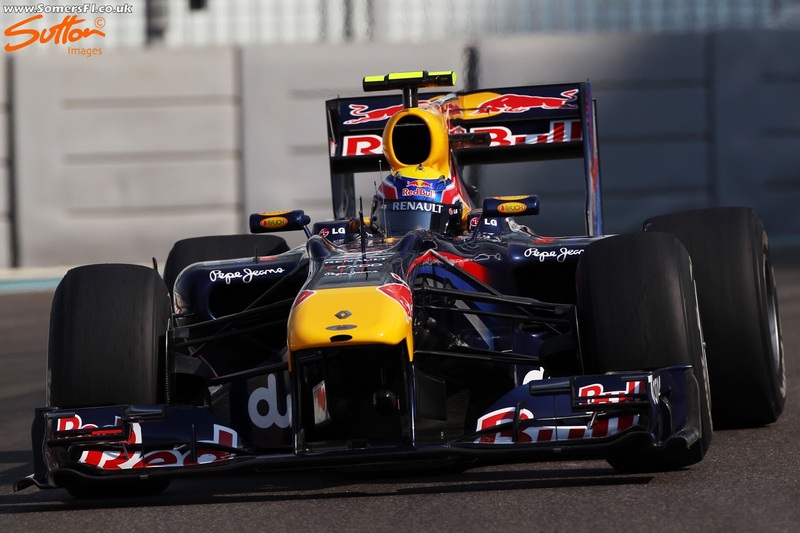 As the development battle intensified so too did the battle between the two Red Bull drivers. 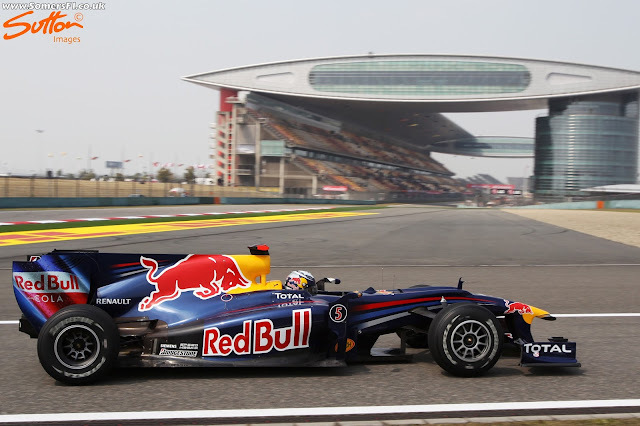 Webber once again took pole position, with the young German resigned to 3rd and split by the McLaren of Lewis Hamilton. The teams policy of letting their drivers race culminated in a collision on lap 40, as Vettel who'd been closing on his team-mate, who'd been in a fuel conservation mode, tried to affect a pass at the end of the back straight, only for the pair to piroet into the run-off area. This ended Vettel's race with a right rear puncture, whilst Webber soldiered on with a broken front wing albeit having lost 2 places to the McLaren's in melee. The team continued to pursue more performance with gusto, as several new parts were made available for evaluation. A new front wing (above, upper) was used by both drivers and saw a change to how the wing elements were distributed. The new wing utilised a full length mainplane flap, whilst the number of flaps was increased to two, albeit with shorter chord lengths. 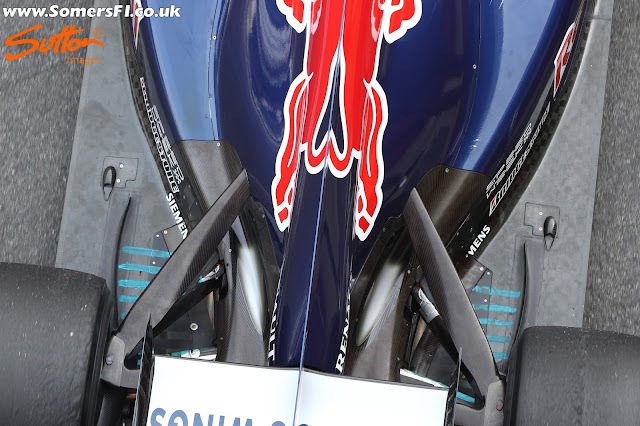 This change also required a change in the endplate design, with an arch added to the leading edge and the slot moved rearward to assist with the turning of airflow around the front tyre and airflow distribution over the flaps. Having revised the sidepod geometry in Spain the team arrived in Turkey with new airflow conditioners. These frame the airflow around the front of the sidepod, dealing with both the wake of the front tyre and how flow moves around the undercut. A slimmer design was employed, demoting the previous cricket bat style appendages to the parts bin. The exhaust configuration was also refined with the metallic section of tailpipe (inset) that was previously exposed making way for a more simple piece of bodywork, with heat treatment applied. This not only removed any transition issues for the exhaust plume but also any fears that the engines movement could cause damage to the area. Lastly the team arrived with their version of the F-Duct to test. Much like the original McLaren system it was connected to the rear wings upper flap with slots on the rear face used to disturb the flow and 'stall' the wing. 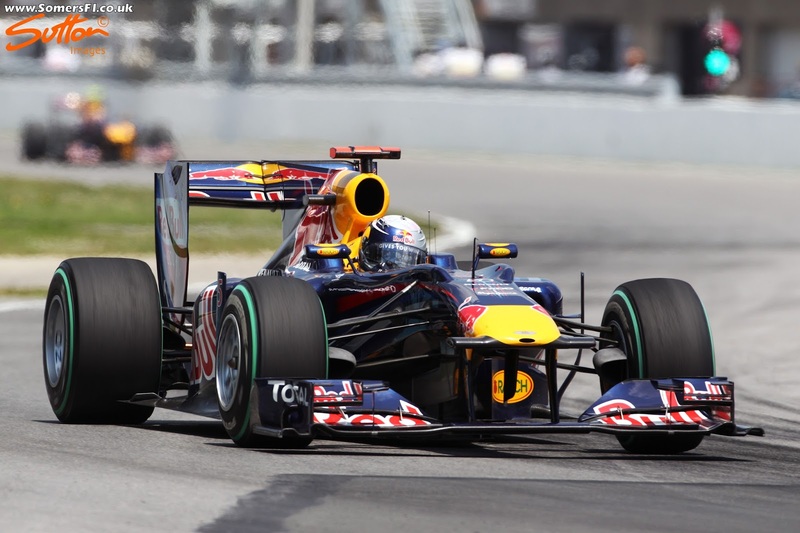 Lewis Hamilton led the way once again in Montreal taking pole position, with Webber and Vettel a few tenths adrift. 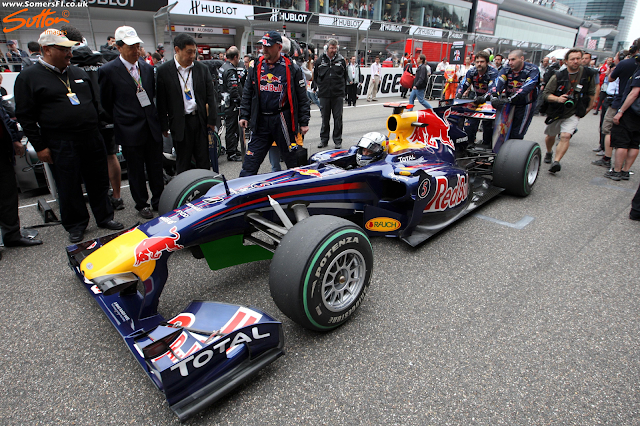 A 5 place grid penalty ensued for Webber as he needed a new gearbox, leaving him to start the race in 7th. 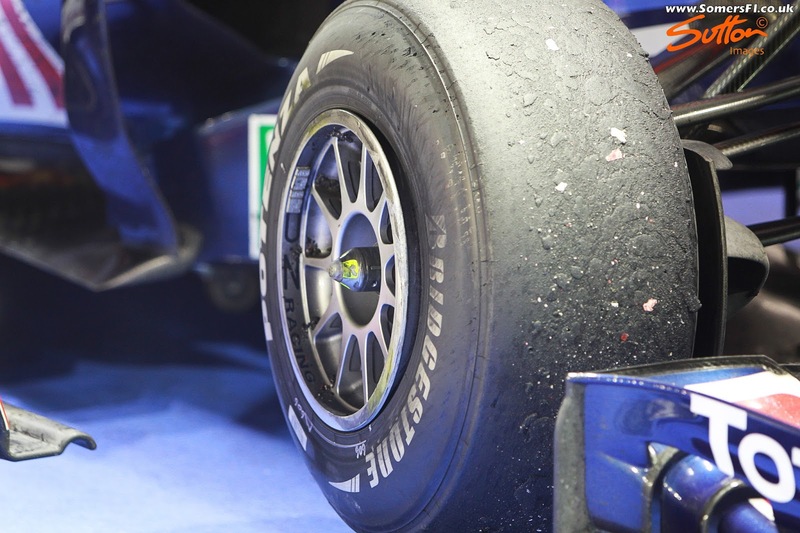 The led the team to run a contra strategy, starting on the Prime tyre, he moved onto the prime at his first stop and would finish the race on the Option tyre. As such, he led for a large portion of the race (Laps 28-49) but didn't have sufficient pace to make up for the poor grid postion, finishing in 6th just behind his team mate. The team returned to the front wing design used prior to Turkey but the rear wing mainplane was amended to suit the circuits characteristics. 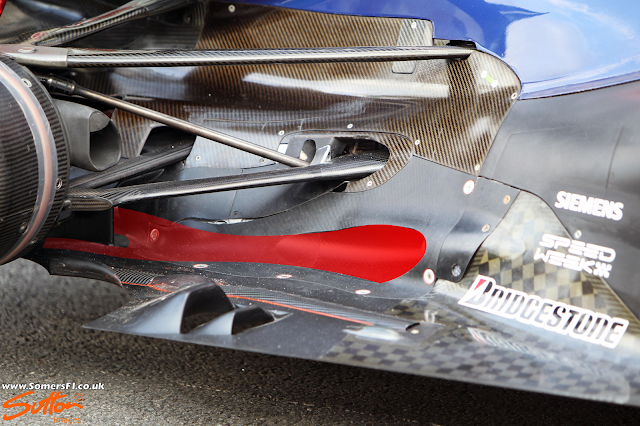 They presented a new diffuser at Montreal with the previous curved outer wall of the diffuser replaced with this sharp edge. This undoubtedly shed a vortex that helped to control the surrounding flow structures. 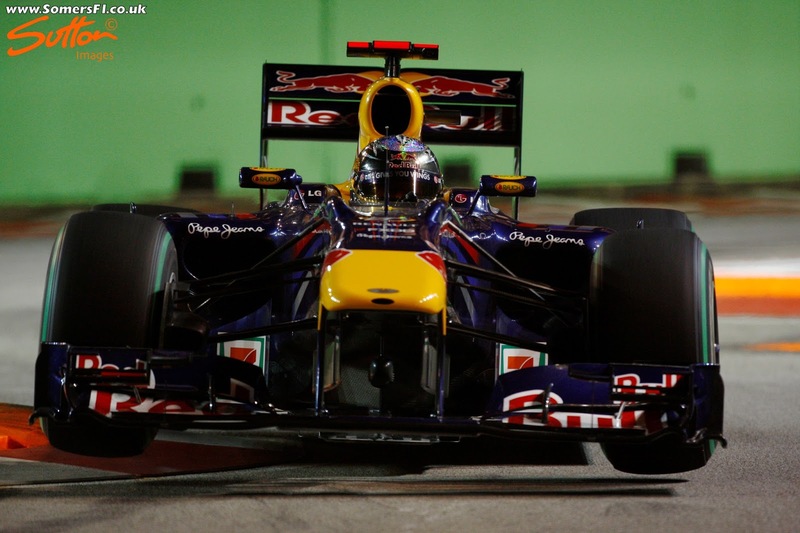 Sebastian Vettel and Mark Webber clinched 1st and 2nd in Qualifying respectively, with Webber 3 tenths ahead of Lewis Hamilton. 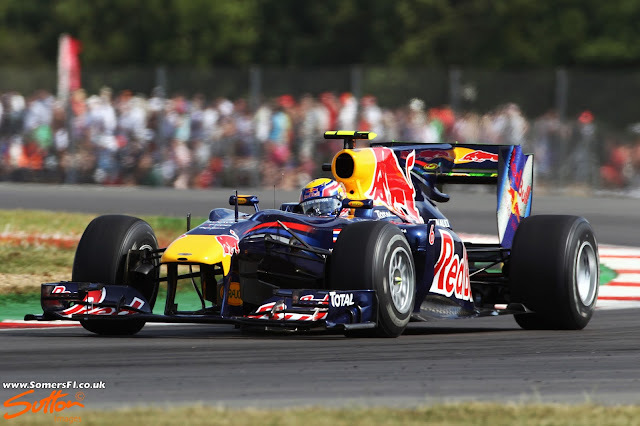 A bullish Hamilton put the moves on Webber and tried to pass Vettel into the first turn, to which some damage ensued. On lap 9 Webber came upon Heikki Kovalainen's Lotus, the speed offset was dramatic, caught unawares Webber ploughed into the back of the Lotus and was flipped into the air and sent careering down the circuit upside down, the destroyed RB6 carcass returning to its usual orientation before coming to rest in the barriers. Vettel went on to win the GP edging ahead of his team mate in the standings, whilst reeling in Lewis Hamilton too. The change made to the diffusers outer shape in Canada was met with further revisions in Valancia. Fillets were made to the diffusers upper surface above each of the vertical strakes, injecting flow into the low pressure region earlier and helping to overcome their height. 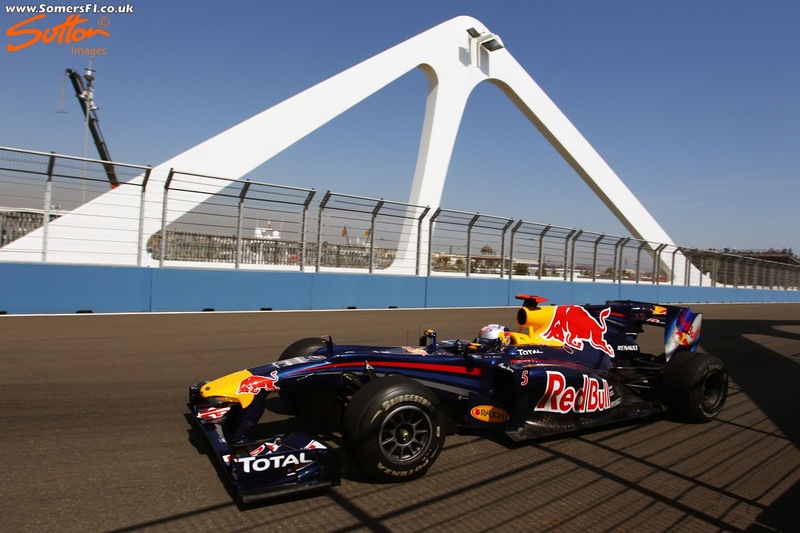 The Red Bull pair were the class of the field in Qualifying once more, with Vettel and Webber taking 1st and 2nd respectively. The start of the race didn't quite go to plan for Vettel though, as he collided with Hamilton at Copse as he attempted a pass on his team mate. This left the German with a puncture, a trip to the pits and a whole heap of work to regain lost positions. Webber led from lights to flag but Vettel marched back through the field aided by a safety car that allowed him to return to the back of the pack. The whole weekend was marred by the events surrounding Red Bull's front wing and only emphasised by Mark Webber's words over the radio as he took victory "Not bad for a number two driver, eh?" The new front wing was a major bone of contention at the British GP, with the team having made only one for each driver. 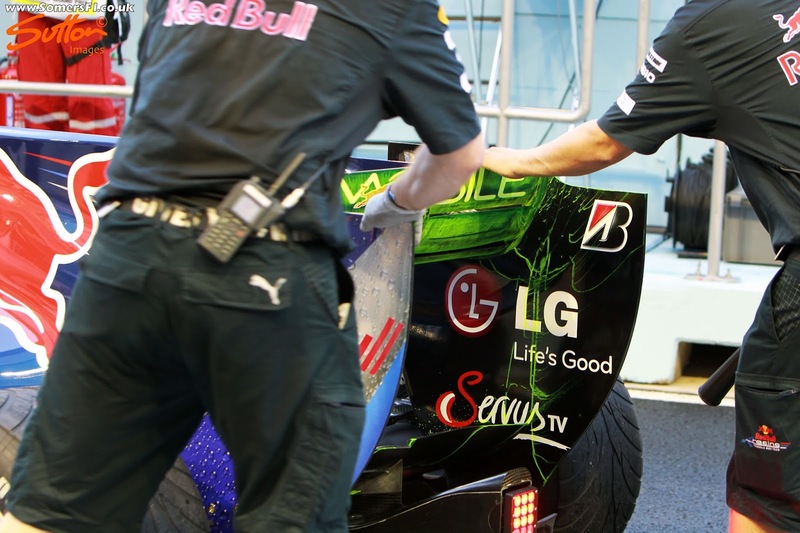 When Vettel's new front wing was broken during practice (below) the team took Webbers allocation and handed it to Vettel for Qualifying. The revised version featured a different shape to the upper flap but, whilst the support mount was previously just made of metal it now featured a carbon cover too. Meanwhile, the endplate featured the lower arc seen on previous iterations (notably visible in the forward facing image) and the rearward slot was increased in length to suit the flap changes and circuit characteristics. Whilst the hoopla focused attention on the wing elements it is also vital to note the changes made by the team to the position of the FOM camera housings. 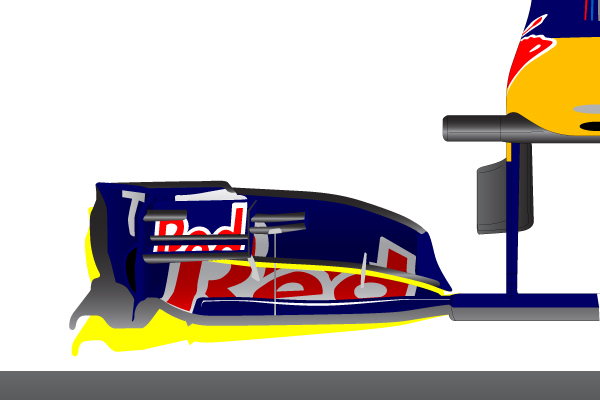 The usual hammerhead configuration (inset) as raced by Webber was changed for the new specification wing. 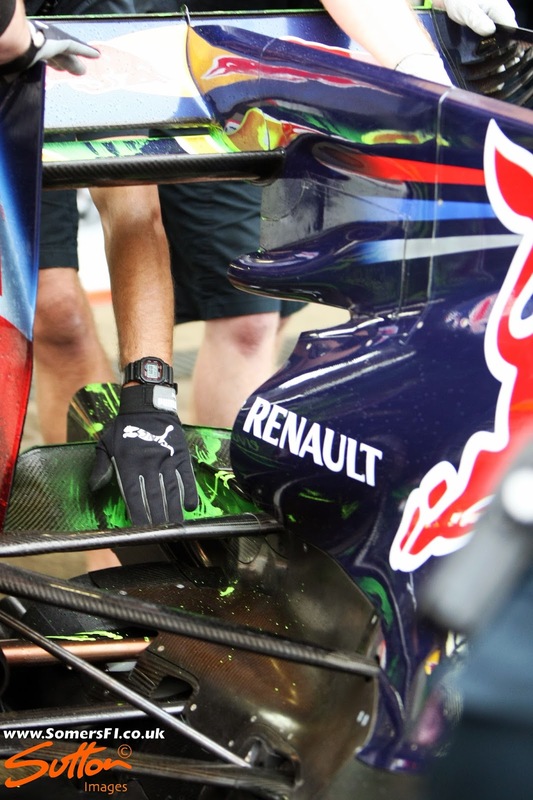 I've highlighted the FOM camera housings in green, which on their own are supposed to be aerodynamically neutral. However, as has been the case for some time designers use them alonside other components to gain an advantage. In this case Red Bull moved the front wing forward, reducing the point at which the mainplane mounts to the front wing pillars. Meanwhile, they mounted the camera housings inside the pylons behind the mainplane, in order that they gain an advantage from both mandated neutral sections (the mainplane Y250 section and the camera housings). The camera housings needed additional support and so small tabs were also added at the base of the pylons (highlighted in purple). The placement of these items means the previously neutral central section of the car can once again generate its own downforce and will create new aero structures which help to control the vortex shed either end of the section (Y250). As we can see in the image above (camera housings once again highlighted in green) it allows the overall surface to have a different angle of attack. Furthemore, this can be trimmed during setup as the camera housings can be angled +/- 5 degrees. "Okay... so... Fernando is faster than you. Can you confirm you understood that message?" Massa duly slowed to allow Alonso passed to take victory much to the discontent of the viewing public, with team orders banned. 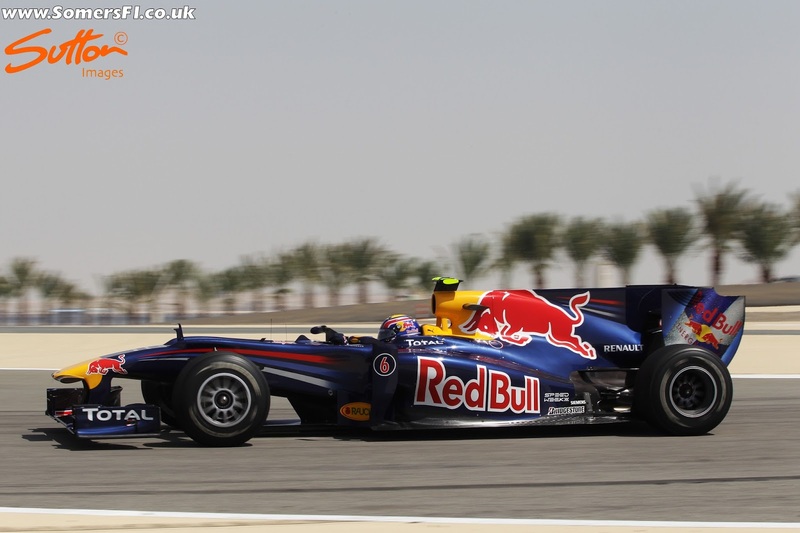 Vettel finished in 3rd whilst an oil consumption issue meant that Webber trailed home in sixth. 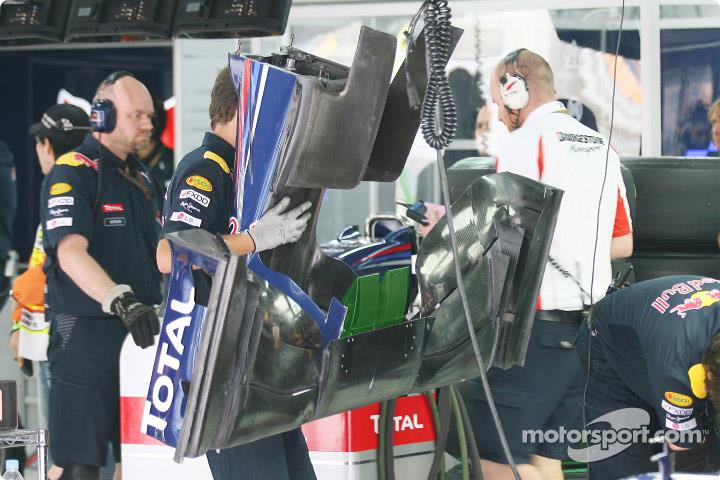 Another new iteration of the teams front wing appeared in Germany. A smaller tier appeared in the upper flap of the wing increasing efficiency and allowing a more aggressive angle of attack to be used on the outboard section. The Red Bull drivers were once again the ones to beat in qualifying, with Vettel and Webber easing into 1st and 2nd respectively, whilst Alonso's best effort saw him 1.2 seconds adrift. The Spaniard wouldn't make life easy for the Red Bull pair during the race though and overtook Webber into turn 1. Vettel started to build an almost unassailable lead which was scuppered by an incident on lap 15 that bought out the safety car. Whilst Vettel and the rest of the pack dived into the pitlane for fresh rubber Webber stayed out, attempting to overhaul Alonso. The stewards didn't take kindly to Vettel's slow pace behind the safety car, insisting he exceeded the 10 car length minimum and issued him with a drive through penalty. This bought him out behind Alonso and his best efforts couldn't get him passed the Ferrari driver throughout the rest of the race. 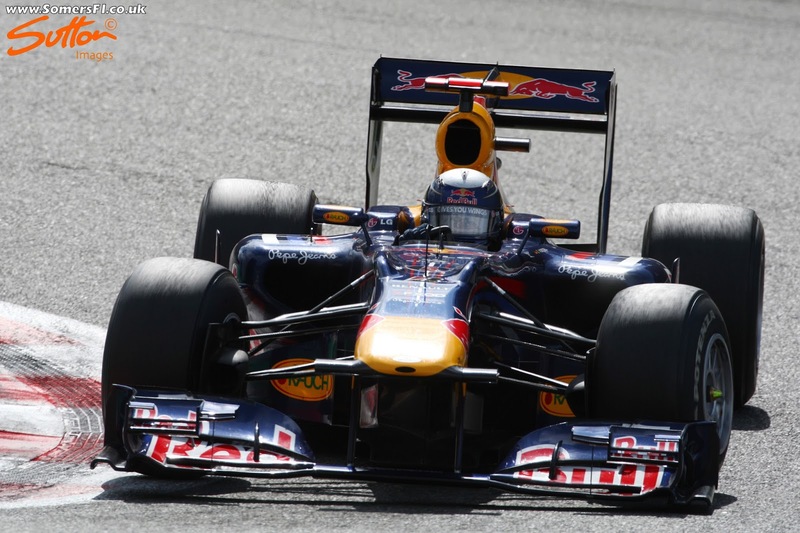 Webber took the victory, whilst Vettel had to settle for third position. The FOM camera housings were once again placed behind the mainplane in Hungary and given the high downforce nature of the circuit it added substance to the conclusion that the configuration was able to help the team generate more dowforce. 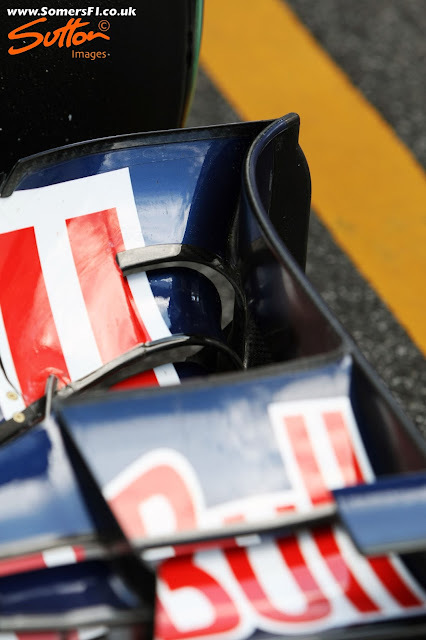 Red Bull and Ferrari's front wings continued to be scrutinised by the rest of the pitlane and whilst both were able to pass the current deflection tests the FIA were eager to curtail the use of flexing components. 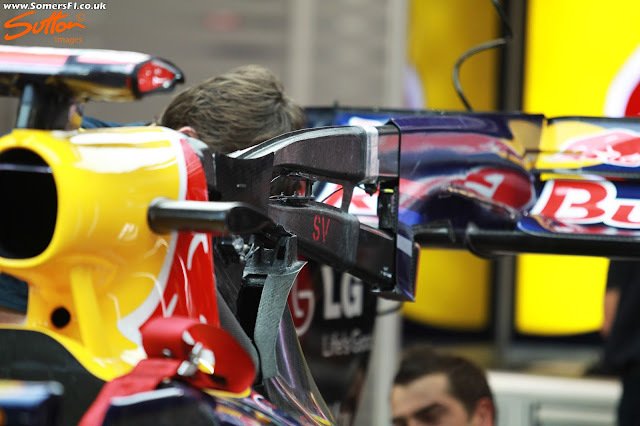 As such, a new deflection test would be introduced for the Belgian GP. Spa has a weather system like no other, with rain showers sometimes blighting only small portions of the track and catching even seasoned drivers unaware. Qualifying was subject to such conditions but Webber got a quick lap in early to secure pole position whilst Vettel had to make do with 4th. Webber's pole position counted for naught come race day as he allowed the revs to drop too far as he released the clutch paddles, putting him anti-stall and demoting him to 6th. Without the Red Bull drivers to keep him in check Hamilton started to gap the field, further assisted by Vettels exhuberance to get past Lewis' McLaren team mate, resulting in Button's retirement, a pit stop to replace a tyre he'd damaged in the collision and a further trip through the pits for the drive through penalty for his role in the collision. Meanwhile, this had allowed Webber to recover 3rd position and left him with a glimmer of hope of taking victory. Then the weather closed in again as it too wanted to play its part in preceedings, as everyone pitted to collect wet weather tyres Robert Kubica overshot his pit box, the time lost resulted in Webber hopping him into 2nd place, where he would finish the race, whilst Vettel finished down in 15th. 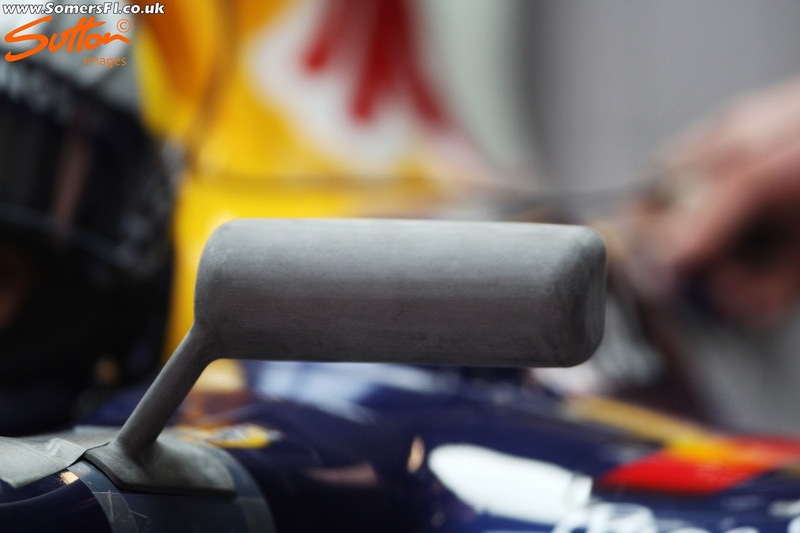 The FIA made good on their promise of increasing the deflection tests in Belgium, rather than needing to sustain a load of 50kgs (50nm) without deflecting more than 10mm they must be able to withstand a 100kg load without deflecting more than 20mm. 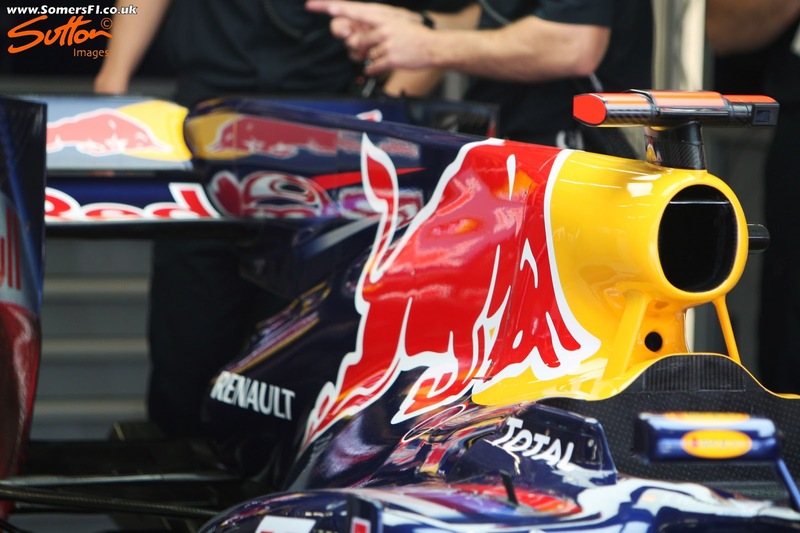 The Red Bull and Ferrari wings which were being contested both passed the increased tests. 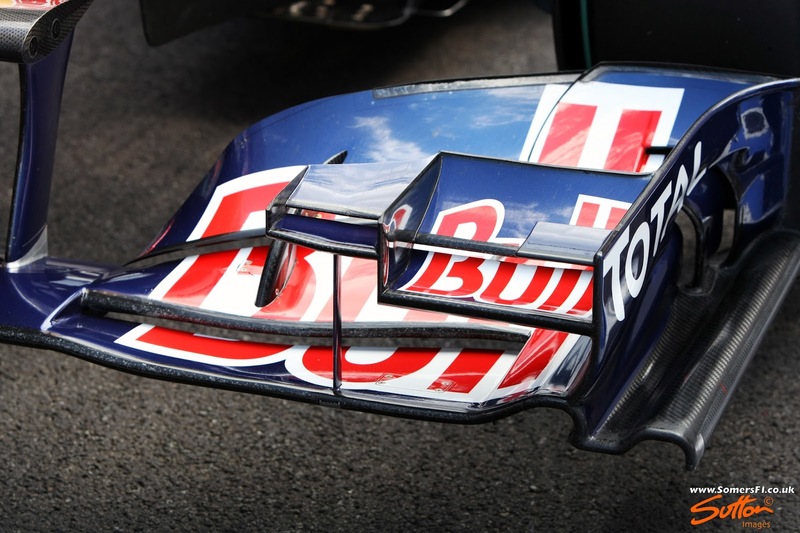 Red Bull's beam wing was revised for the Belgian GP with fillets cut into the outboard sections and a V groove placed in the central section. This was done to boost straightline speed without severely harming downforce levels. A mistake by Vettel in qualifying put him down in 6th whilst Webber struggled too, placing his RB6 in 4th. Webber had what was becoming a traditional bad start and found himself down in 9th but steadied himself and started to make his way back through the field. On lap 20 Vettel, now down in 7th, he had a loss of power and dropped back into the claws of his team mate. He overcome his earlier issues taking 4th, whilst Webber crossed the line in 6th. 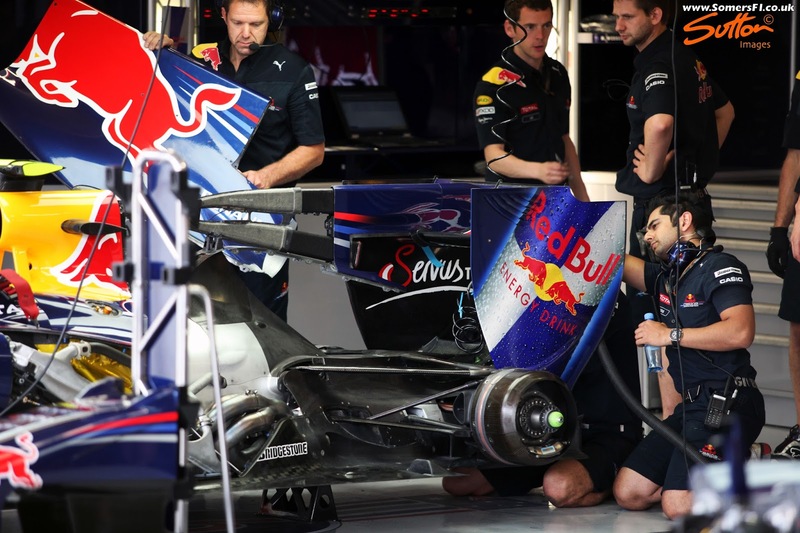 Ahead of the GP the FIA instructed the teams that they may increase the test procedures introduced at the last race, as they tried to get on top of the flexi wing situation. 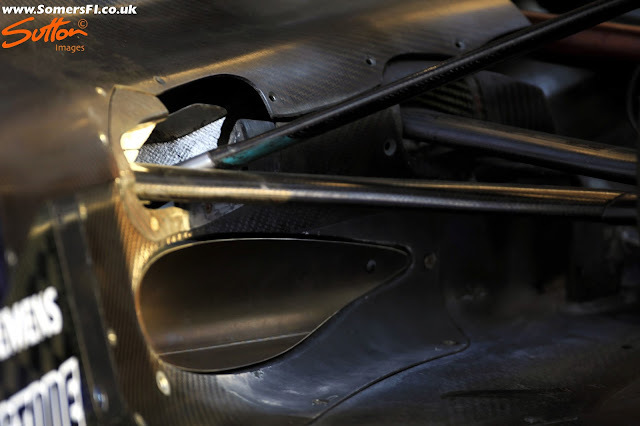 Furthermore, as logic dictates that putting the front wing closer to the ground you must also do the same with the splitter, ergo they believed it must also be deflecting, as such the tests would cover this too. A light brush with the wall during Q3 was enough, according to Vettel, to keep him off pole position as he lost out to Alonso by just 0.067 seconds, whilst team mate Webber was a little shy of 6 tenths off and took 5th. The race got underway without either Red Bull driver making up ground, however, when a safety car slowed things down after just 4 laps the team instructed Webber to make a stop. He was concerned by the teams call but duly took on the Prime tyre and set about carving his way back through the field. Alonso and Vettel, who didn't pit under the safety car, set about building a lead to cover his charge and traded fastest laps until their simultaneous stops on lap 29. A safety car on lap 35 bunched the pack, allowing Hamilton a run on Webber along Raffles Boulevard but the two touched in turn 7. 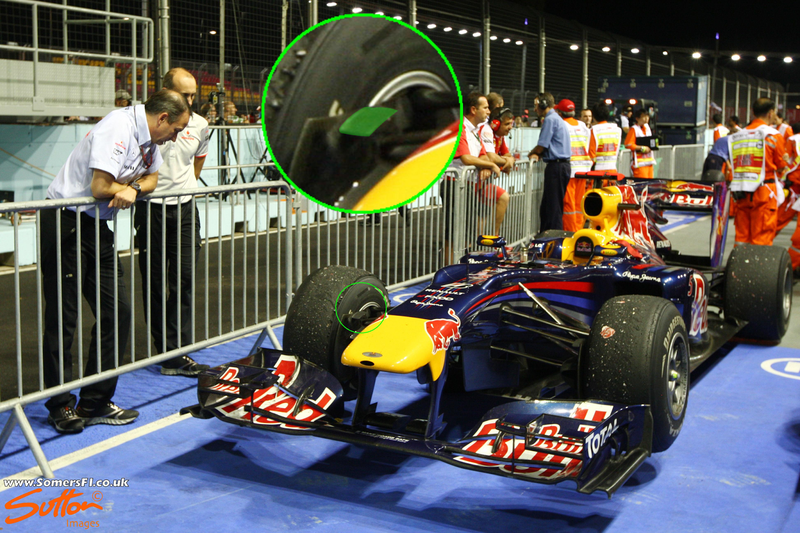 This led to Hamilton's retirement and left Webber with a vibration he'd have to manage as the tyre was pushed slightly off the rim. 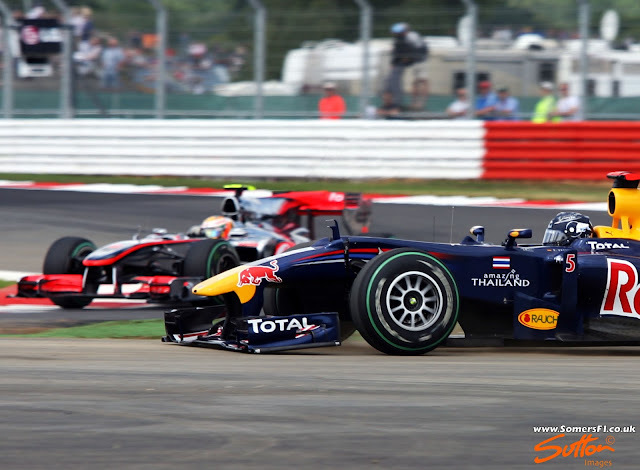 Meanwhile, the battle between Alonso and Vettel had intensified, with Vettel pushing hard for victory. 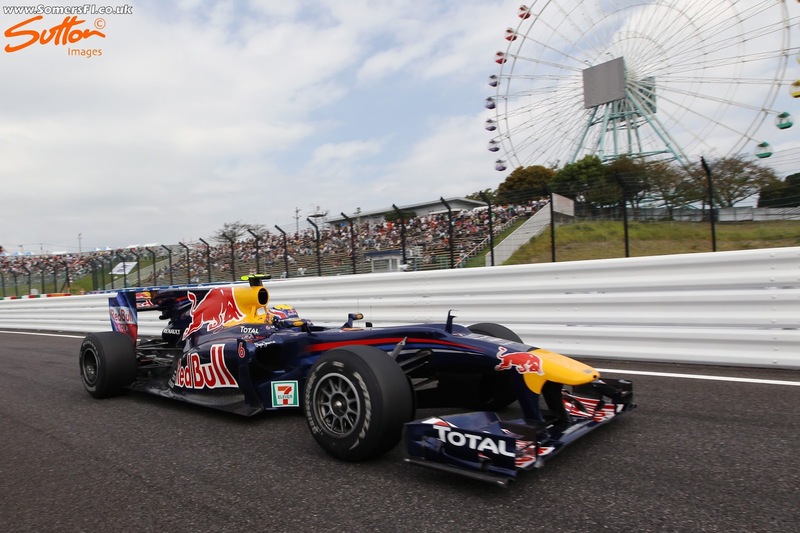 They crossed the line with just 0.293 seconds splitting them, with Webber finishing nearly 30 seconds adrift but continued to lead the championship. It may seem like a very minute detail but the team added this small control fin on the upper quarter of the brake duct in Singapore. The fin would help to control airflow around the inner shoulder of the tyre, assisting in flow downstream, something of particular importance to the leading edge of the sidepod for example. 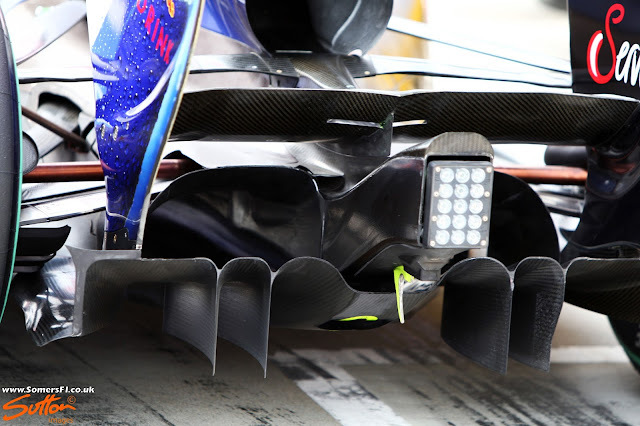 Red Bull introduced a new F-Duct system for Singapore, which rather than stalling the upper flap it stalled the mainplane instead. As we can see in the upper image, the pipework now connects to the foward face of the mainplane, whilst the Y75 slot was reintroduced on the upper flap. In the lower image the team have applied flo-viz to the wing to correlate their findings and make sure the F-Duct is working as planned. This shows us where the slots are present in the mainplanes rear surface (upper of the two horizontal dark lines present in the flo-viz). Aside from the driver controlled F-Duct, the team also combined this installation with the mainplane duct used in Monaco. 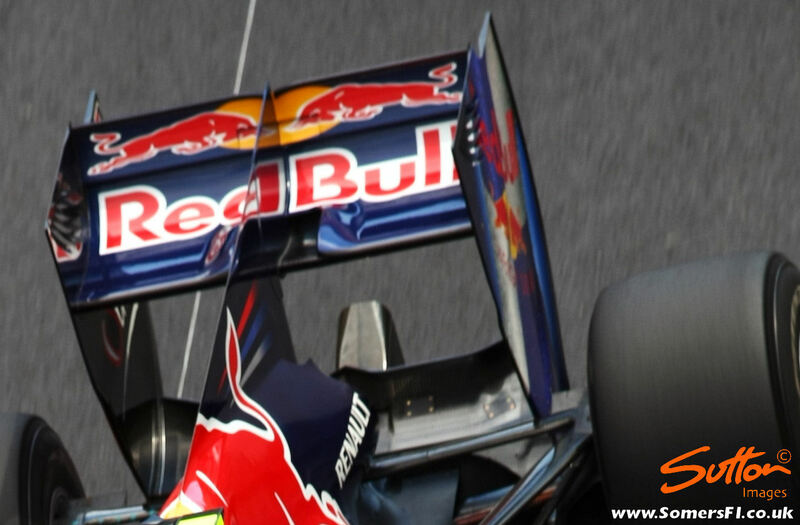 The duct on the front face of the wing fed the hollow wing and ejected it out through the larger horizontal slot on the rear face, imitating a three piece rear wing. Qualifying on Saturday was postponed and rescheduled for Sunday as the weather battered the region. The wet weather from the preceeding day had left the circuit pretty green and a few damp patches could still be found offline. As predicted the Red Bull pair dominated preceedings fastest in each of the qualifying segements, with Vettel take pole position swiftly followed by Webber. 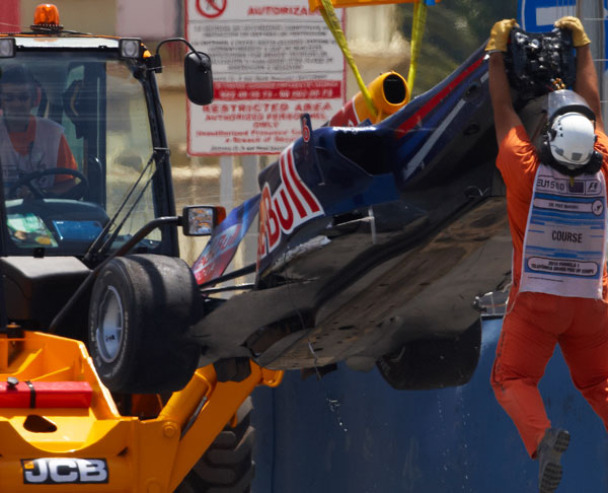 An accident on the way to the grid meant that Di Grassi wouldn't start the race and more incidents swiftly followed, with a further 4 drivers missing by the end of the first lap. This bought out the safety car and whilst the field began to bunch it became apparent that Kubica, who had leaped Webber at the start, was now missing, having been forced to stop when his right-rear tyre had come free. 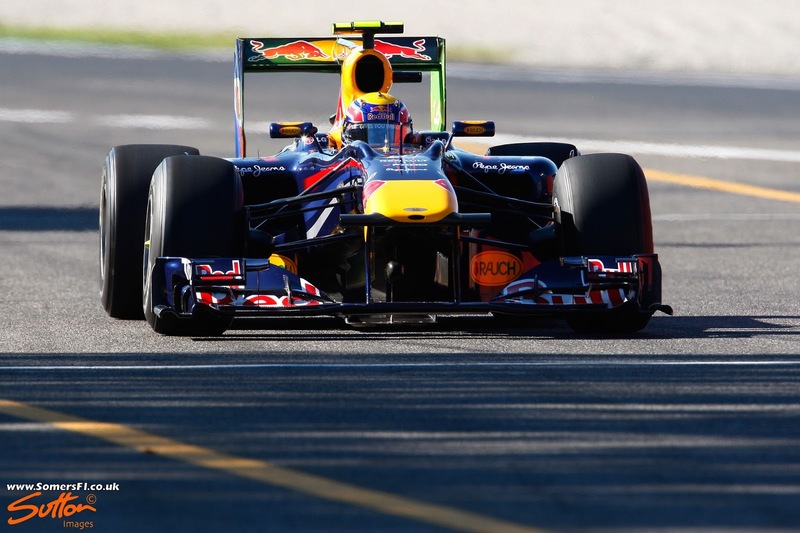 The Red Bull pushed one another hard with less than a second seperating the pair at the chequered flag. Vettel was victorious over his team-mate, while the retirement of Kubica and the subsequent finish positions of Alonso, Button and Hamilton meant that the title was still a five horse race. 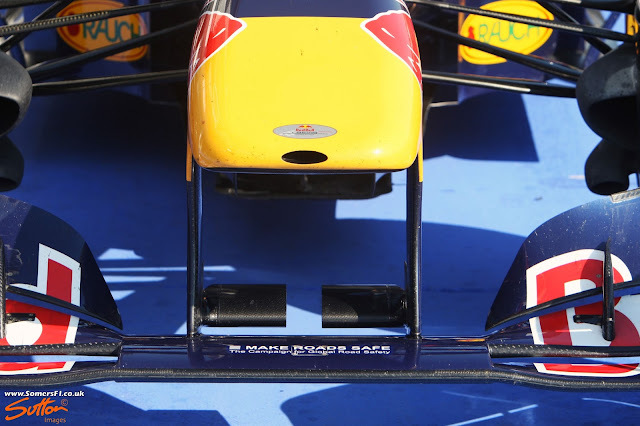 Red Bull retained their new F-Duct design for the Japanese GP but changed the design of the lower beam wing, with a much shorter chord at the outboard sections creating a bow shape, increasing overall efficiency. 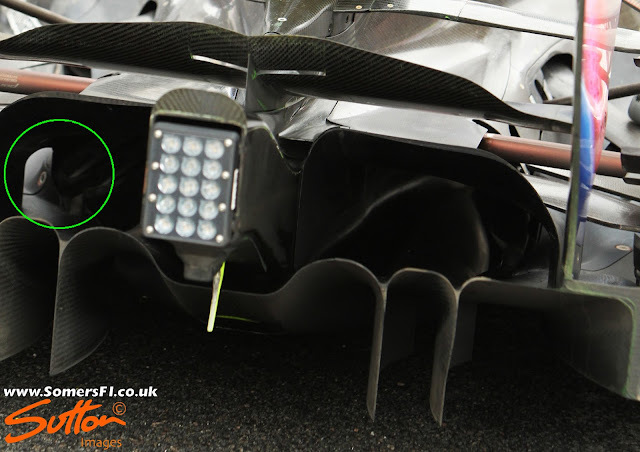 You'll note in this shot that the team aslo revised the outer sections of the diffuser, adding heat treatment to the surfaces. The deck ahead of the rear tyre also saw revision with an additional tyre squirt hole added, in order to improve how airflow shed by the rear wheel into the diffusers path was controlled. The Red Bull drivers completed another front row lockout with Vettel and Webber respectively, whilst Alonso was a few tenths adrift. Come race day, rain overnight meant starting on the wet weather tyres which lasted all but 3 laps with the drivers all complaining of poor conditions. The race was suspended for 45 minutes whilst race control waited for the weather to improve and then restarted behind the safety car. It wasn't long after the safety car had peeled off and back up to racing speed that Webber found himself in a spot of bother, spinning across the track, collecting Rosberg and finishing both their races. The safety car was deployed once more as the marshalls cleared the cars and debris, swiftly followed by the third safety car of the day. This led to a slew of tyre changes as the drivers moved from the full wet to the intermediate, at which point Alonso dropped a place to Hamilton, following a poor stop. It was all for nothing though, as the McLaren driver went deep into turn 1 as the field went back to racing speed, allowing Alonso to take the place back. Alonso had the bit between his teeth, chasing Vettel down whilst producing the fastest laps of the race. However, Vettel suffered an engine failure on lap 45 and subsequently retired. With both Red Bulls out of the race Alonso and Hamilton finishing 1st and 2nd the championship race was wide open still as Alonso now led with 2 to go. An extraordinary display during Q3 saw Nico Hulkenberg qualify on pole for Williams, over a second quicker than the Red Bull's of Vettel and Webber. As four of the five title hopefuls lined up in the top five for the grand prix it was shaping up to be a great race. 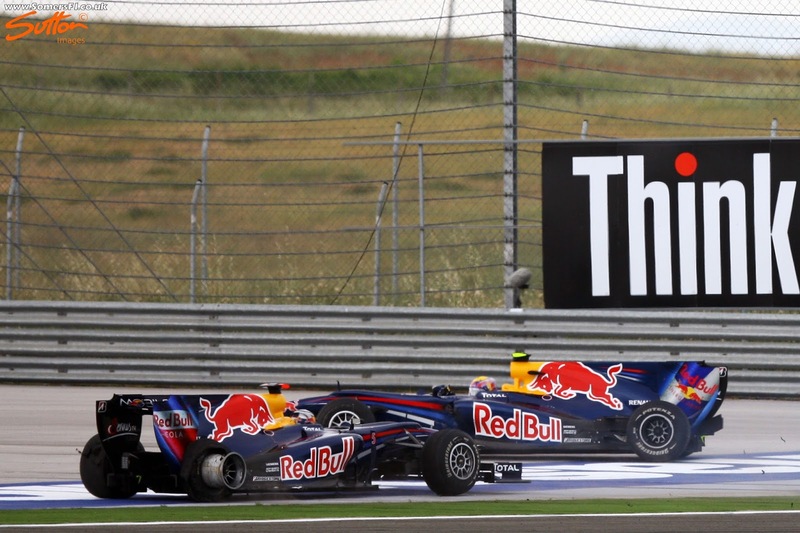 Vettel took charge of the race into the first corner, whilst Webber dispatched of Hulkenberg in turn 4. On lap 2 Hamilton made an error in turn 4 that allowed Alonso to slip by but, he found himself caught behind Hulkenberg allowing the Red Bull drivers to build a gap. Alonso got brave on lap 7 and made the pass on the slower Williams as he had to go defensive in turn 4. Hulkenberg continued to defend against Hamilton until the pitted at the end of lap 14. Hamilton stayed out but continued to complain of a lack of grip meaning he was the first of the front runners to blink and take on fresh rubber. A crash by Liuzzi on lap 51 bought out the safety car and bought the pack closer together once more but, with the lapped cars of Barichello and Petrov between Vettel and Webber it did little to improve the battle. Vettel took the victory with Webber 4 seconds behind, whilst the formation finish of Alonso, Hamilton and Button meant they'd all be mathematically challenging for the title at the last race. Vettel clinched his 10th pole position of the season, joining 7 other drivers able to match the feat. Meanwhile, Webber couldn't match his team mate and found himself down in 6th. The other title protagonists Hamilton, Alonso and Button filed in 2nd, 3rd and 4th respectively. As the race got underway, both Vettel and Hamilton retained their positions but Alonso lost out to Button. A safety car owing to a collision with Schumacher and Liuzzi saw the action tempered until lap 11. Both Webber and Alonso were forced into earlier stops than they'd have liked owing to high tyre degradation, whilst Vettel and Hamilton continued to post faster times on the worn rubber. Alonso and Webber's progress, as they now lay astern, was hampered by Petrov, leaving Vettel, Hamilton and Button with the podium honours. Vettel's victory meant he led the championship for the first time and stole the title from under the noses of his counterparts. 2010 provided the teams with an immense challenge, as the rise of flexi-wings, F-Ducts and blown diffusers intensified the development battle. The diversity in these solutions meant we were treated to some very different ideas as the teams battled for supremacy. 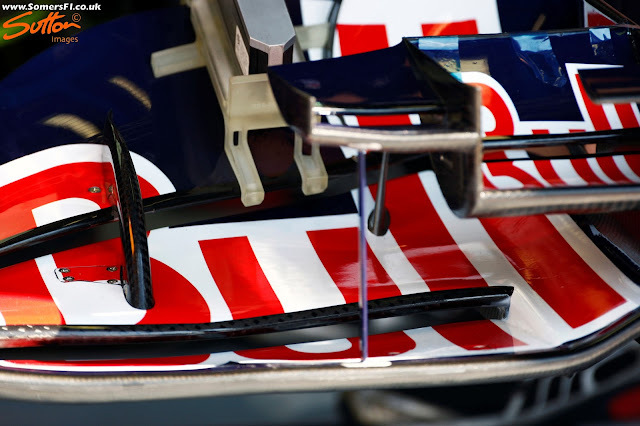 Red Bull's approach to flexible front wing design and a well engineered off throttle double diffuser gave them an advantage over many of their rivals. Their later adoption of the F-Duct solidified their charge toward victory as the RB6 became not only the best car at the apex but also one to be reckoned with on the straights. Great article Mr Somerfield.Can you make something like this for MP4-26? Thanks Matt, great read that brought back a whole lot of memories.